Map It! 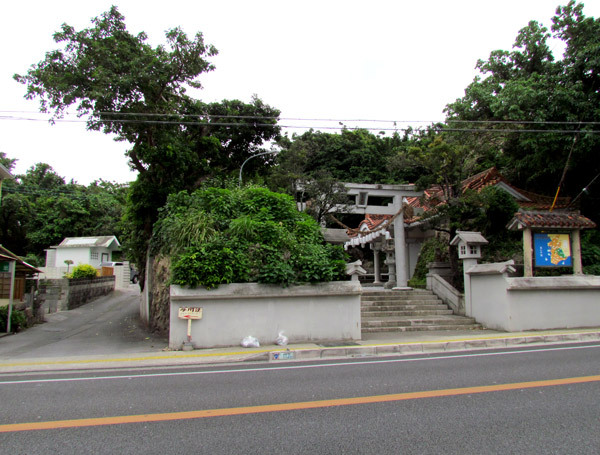 Okinawa: "The Hakugin-do Shrine - Itoman City"
The Hakugin-do Shrine (or Hakugindo) in Itoman City is a very special shrine to the people of Itoman and its fishermen. 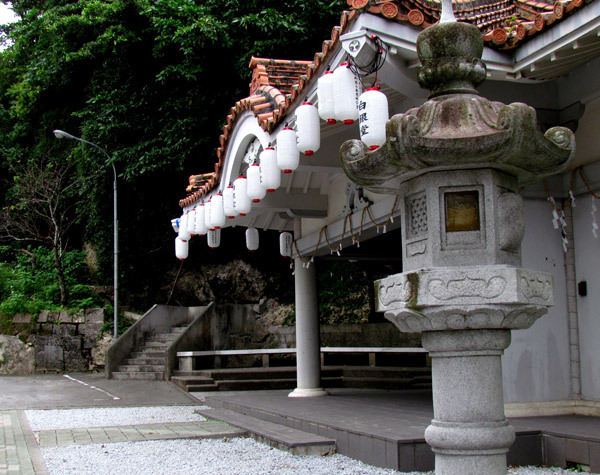 A god referred to as Shirogane-no-oibe (God of the Sea) is enshrined here and it is to whom the Itoman residence pay homage to for a prosperous yield of fish, as well for a safe return from the sea. The shrine is also referred to as "Yoriage-utaki" and the area around the shrine is said to house graves of local fishermen that once lived in the area long ago. The exact date of the shrine's origin is not exactly certain. 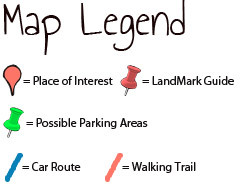 If local legends are true then it could possibly date back for centuries. But an “impressive” structure was later built in 1933, according to the book, Okinawa; A People and Their Gods, published in 1969. However, it was later destroyed in the aftermath of the Okinawan Battle. Travel writer, Michael R Lynch, shows Then-and-Now photos of the post-war structure taken around 1958 and a more recent photo taken in 2012. The author of the aforementioned book also tells of a story that long ago a young wife of a king (name & date not mentioned) once came to this shrine to pray for a son. Her wishes had come true, and subsequently, it became a custom for new wives wishing for a son to come here to make their wishes known. Legend of Hakugin-do. Perhaps a more intriguing legend is now being circulated. This folklore is referred to as the “Legend of Hakugin-do” in which the story tells of act of mercy shown by a Samurai towards an Itoman fishermen. The enshrined cave had became the focal point throughout the story and later, a symbol of their friendship. A YouTube video taken by a blogger, Tom Corrao, shares this video posted on his blog, Okinawaology. In the video, a tour guide describes the details and circumstances surrounding this legend. Author's Note. According to the Itoman City Official Website, a large rock, referred to as the 'God Rock' sits at the south end of the shrine, however it wasn't certain which actual rock the website was referring to. Directions. 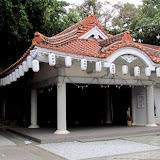 The Shrine is in Itoman City. It sits along Highway 331 (left if you are going south). Look for the Torii Gate to the side. Note. There is Highway 331 and there is the 331 Bypass that split near the Naha Airport. Study the map carefully. If you are going south, take the Bypass by continuing straight rather than turning right as if you are going to Senega Jima. You will then come to a traffic intersection where 3 Highways begin (Highway 231, 68, & 331). Take the 331 south. About another 4.5 km the shrine will be to your left. You will cross over a very noticeable river stream about 400m before you reach the shrine. Parking. Parking is available. The parking entrance is just before the Torii Gate (north of the gate). See picture for details. 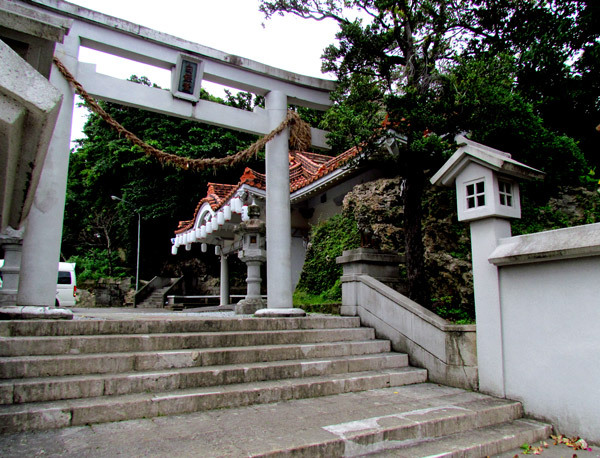 Note: The Shrine will mostly likely sneak up on you, since the Torii is tucked in from the road. Book: Okinawa, A People and Their Gods, James C. Robinson, Tuttle Publishing Company, 1969.